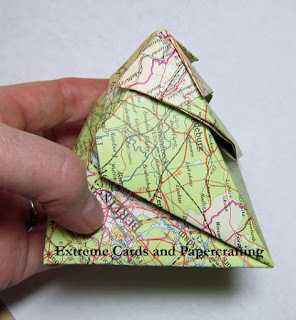 Here's a nifty papercraft, an origami Christmas tree made from a map. 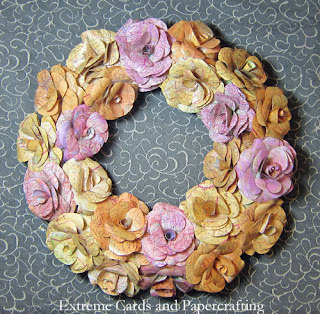 The base is square and the folds spiral around, tucking in at the top. I looked through a discarded atlas to find a map with a lot of green. You can boost the color by sponging some green ink on the map if you need to. You will see a tiny bit of the back side of the paper at the very tip of the tree (the beige part on my tree). The finished size of the tree depends of course, on the size square you start with. I used a 9" square of atlas page and ended up with a 3" tall tree. 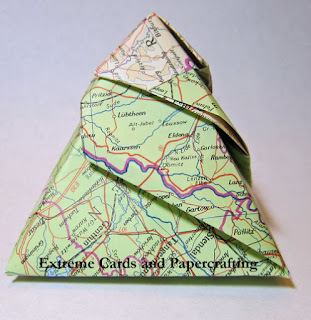 The origami tree fold was designed by Jannie van Schuylenburg. 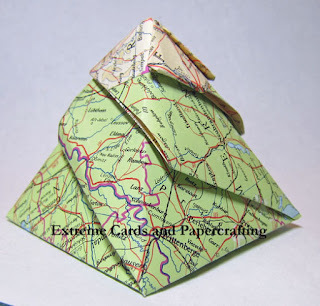 Link to folding directions by Leyla Torres.